The battle over Judge Brett Kavanaugh’s nomination to the U.S. Supreme Court could attract record amounts of spending. In addition to groups whose identities and positions are well-known, groups that do not disclose their donors will likely play an unprecedented role in the fight. As a tool for reporters, advocates, and the public, the Brennan Center is using the chart below to track all television ad spending around the nomination, including the cost of individual ad buys, spenders’ identities, target markets, and more so you can easily see who’s wielding influence, and how, to determine the makeup of the nation’s highest court. We’ll be updating the chart each week as new data becomes available, and we’ll highlight the most noteworthy developments. * These ads were launched before the nomination of Brett Kavanaugh. * This ad was launched before the nominatiwhon of Brett Kavanaugh. This ad says “if Donald Trump has his way, the next Supreme Court will turn the court against a woman’s constitutional right to safe, legal abortion." * This ad was launched before the nomination of Brett Kavanaugh. This ad says "when politicians tried to undermine the liberty of women, she [Sen. Collins] stood up and said no," and argues that Trump's "nominee must publicly declare a position on Roe." This ad argues "Trump says he'd only pick justices who would reverse Roe v. Wade," and who would "overturn the Affordable Care Act." This ad warns that "Kavanaugh refused to uphold key patient protections in the past, and if he joins the court, he could vote to end these protections for good." This ad argues Brett Kavanaugh on the Supreme Court "threatens to continue selling out America to powerful special interests," noting "We hold these truths to be self-evident, and we will hold our Senators accountable." This ad asks if Sen. Donnelly is "more interested in siding with Chuck Schumer and Elizabeth Warren than Hoosiers?" and asks, "Has he forgotten who he represents?" This ad argues, "Heidi Heitkamp has a decision to make: does she support Kavanaugh and prove she's on the side of the President and you, or does she side with the radical liberals?" 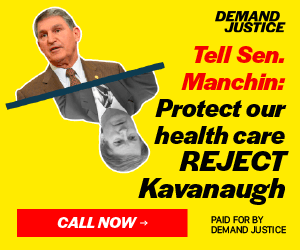 This ad asks viewers to "Tell Joe Manchin you won't be fooled by his tricks - and you won't forget how he votes on Kavanaugh." This ad asks if Sen. Doug Jones will "side with the people of Alabama, and support Kavanaugh, or will he join radical liberal Senators?" and asks viewers to "Tell Doug Jones his vote on Kavanaugh is something you'll never forget." In this ad, a former Kavanaugh clerk says "he also treated me as an equal and never made me feel like a minority." This ad says Trump "is pushing for a new Supreme Court Justice who could vote with him and overturn these [healthcare] protections." In this ad, a former Kavanaugh clerk says she hopes "the Senate confirms him quickly, because he will be an excellent Supreme Court Justice." In this ad, a former Kavanaugh student says Kavanaugh "applies the law faithfully." This ad says "four liberals on the Supreme Court would take away your right to self-defense... President Trump chose Brett Kavanaugh to break this tie." 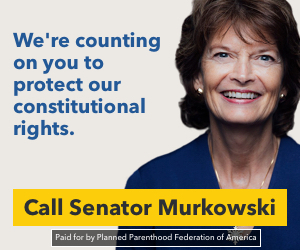 This asks viewers to "tell Senator Murkowski, defend our right to self-defense." In this ad, a woman recounts, "I went to my doctor, and he said, you need to go to Montreal for an abortion," and asks Sen. Collins to "protect rights for women." In this ad, President Trump says "there is no one in America more qualified for this position, and no one more deserving." Sponsor: America First Policies, Inc. 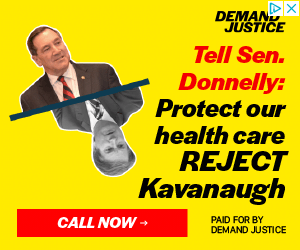 This ad asks viewers to "Tell Senator Donnelly this is no time for obstructionist politics." This ad asks viewers to "Tell Joe Manchin enough - he works for us, not Chuck Schumer." This ad features a woman who says "I am the voice of a lot of women of my generation who died from an illegal abortion." This ad argues "a woman's right to have her own healthcare decisions - that's freedom, that's what America is." This ad asks viewers to "encourage her [Sen. Collins] to continue her thoughtful and balanced approach to the confirmation process." This ad features conservatives criticizing Kavanaugh as "the establishment pick," and argued Kavanaugh has "ruled for special interests" and "lives the high life in Washington." In this ad, Louisa Garry says Kavanaugh is "of the highest integrity as a person" and "would be a great Supreme Court Justice." This ad argues "Susan Collins is playing political games with Maine women." This ad argues "your right to self-defense depends on this vote" and asks viewers to "tell Senator Donnelly, defend our right to self-defense - confirm Judge Kavanaugh." This ad says Kavanaugh "called a judge who fought against the Roe decisions his hero" and ask viewers to "Tell Lisa Murkowski women's lives are on the line." This ad says "the Supreme Court itself has relied on Kavanaugh's judicial opinions 13 times." This ad says "part of the creed of Alaska is that we have the right to privacy." This ad simulates news broadcasts, saying "by a 5-4 margin, the Supreme Court...sided with the Trump Administration to overturn the Affordable Care Act" and that "Brett Kavanaugh cast the deciding vote." In this ad, a Maine citizen says "I am worried that all of our daughters will not have a choice." 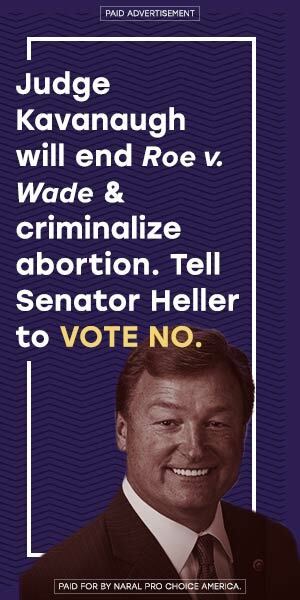 This ad says "a vote for Kavanaugh is a vote to end Roe v. Wade, criminalize abortion, and punish women." This ad says "the Senate needs to put gridlock aside and confirm Brett Kavanaugh." This ad says "I fought for your freedom, Senator Collins. Now it's your turn to fight for mine." This ad says "members of Maine's legislature voiced support for Kavanaugh." This ad says "Jon Tester has two faces. In Montana, he says he supports gun rights, but in Washington D.C., his votes tell a different story." This ad says, "no wonder the Washington politicos don't like Kavanaugh - he's not one of them." This ad features testimony from the Kavanaugh hearings, and asks viewers to "Tell your Senator, confirm Kavanaugh." This ad says "the more people get to know Brett Kavanaugh, the more they like him." This ad says "protect access to safe and legal abortion - reject Brett Kavanaugh,"
This ad says "Kavanaugh fails Collins' own test - if she votes for him now, she won't just be breaking her word, she'll be responsible for gutting Roe." In this ad, one woman says, "if she [Sen. Collins] really believes in women's rights... then she needs to stand up." This ad features the words of "Christine Blasey Ford, describing the attack she suffered when she was just 15 years old," and asks, "will Susan Collins listen to her now?" This ad features the words of "Christine Blasey Ford, describing the attack she suffered when she was just 15 years old," and asks, "will Cory Gardner listen to her now?" This ad features the words of "Christine Blasey Ford, describing the attack she suffered when she was just 15 years old," and asks, "will Lisa Murkowski listen to her now?" This ad features the words of "Christine Blasey Ford, describing the attack she suffered when she was just 15 years old," and asks, "will Dean Heller listen to her now?" This ad argues "Feinstein didn't find the allegations against Kavanaugh credible enough to tell the FBI or even the Senate," and says "it doesn't add up." This ad says "Kavanaugh says he's 'never done anything like what the accuser describes - to anyone.'" This ad features women’s testimony, with the hashtag #IStandWithBrett. 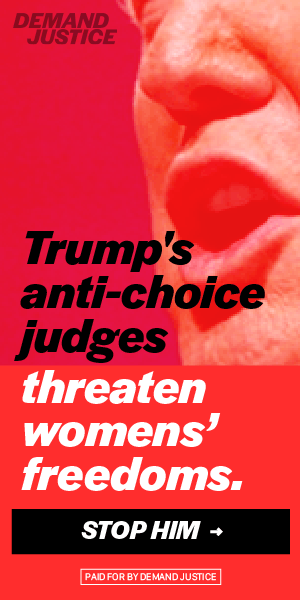 This ad says "Trump's anti-choice judges threaten womens' freedoms." 'Cloud.' 'Legitimacy crisis.' 'Taint.' Legal Experts on Kavanaugh Joining the Court. How Much Dark Money is Fueling the Kavanaugh Confirmation Fight?